Confident. That was how Father Peter Loy Chong described his demeanor as he prepared to take up the lead role in the Catholic Archdiocese of Suva today. Father Chong took his Rites of Fidelity at the Sacred Heart Cathedral in Suva yesterday, the final step before his formal ordination as the Archbishop of Suva. And the 52-year-old, who has maternal links to Nataleira in Dawasamu, Tailevu, said he wanted his actions to mirror the way he felt. “I read it (rites) with passion and confidence and I really tried to believe in every word that I was saying there and I hope that was how I sounded,” Father Chong said. “I felt confident doing that because if you’re not confident by now then there’s something wrong,” he added with good humour. 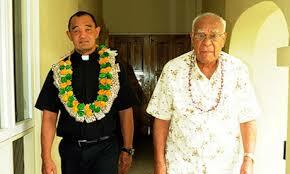 Father Chong said he was ready for his new position, having prayed continuously over his decision to succeed Bishop emeritus Petero Mataca as the head of the Catholic church in Fiji. He explained the support from his surviving siblings and their children was more than he could ask for with his nieces and nephews even purchasing the ring he would be bestowed with today. “My sisters have been great support for me not only with the material things but they’ve been very prayerful. And my nieces and nephews, they’ve been of great support to me. I cannot ask for anything better,” he stated.